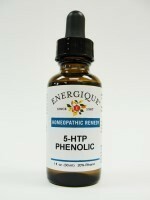 5-HTP is the active form of tryptophan, an essential amino acid. It functions as the precursor to serotonin, and has a definite antidepressant effect. 5-HTP 6x, 12x, 30x, 12c, 30c and distilled water. 20% ethanol.